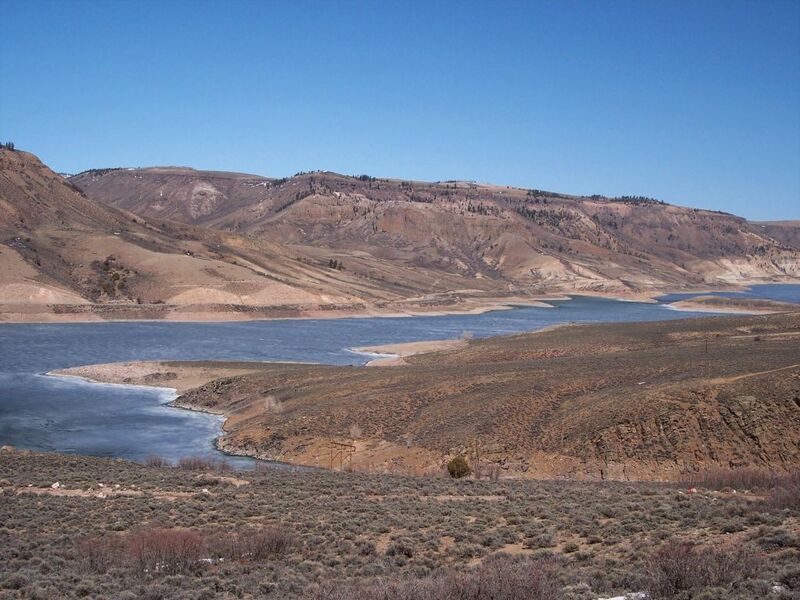 The April 1 forecast for the April – July unregulated inflow volume to Blue Mesa Reservoir is 925,000 acre-feet. This is 137% of the 30 year average. Snowpack in the upper Gunnison River basin is currently 132% of average. Blue Mesa Reservoir current content is 259,000 acre-feet which is 31% of full. Current elevation is 7440 feet. Maximum content at Blue Mesa Reservoir is 829,500 acre-feet at an elevation of 7519.4 feet. The peak flow and shoulder flow components of the Black Canyon Water Right will be determined by the May 1 forecast of the April – July unregulated inflow volume to Blue Mesa Reservoir. If the May 1 forecast is equal to the current forecast of 925,000 acre-feet of runoff volume, the peak flow target will be 6,513 cfs for a duration of 24 hours. The shoulder flow target will be 915 cfs, for the period between May 1 and July 25. The point of measurement of flows to satisfy the Black Canyon Water Right is at the Gunnison River below Gunnison Tunnel streamgage at the upstream boundary of Black Canyon of the Gunnison National Park. 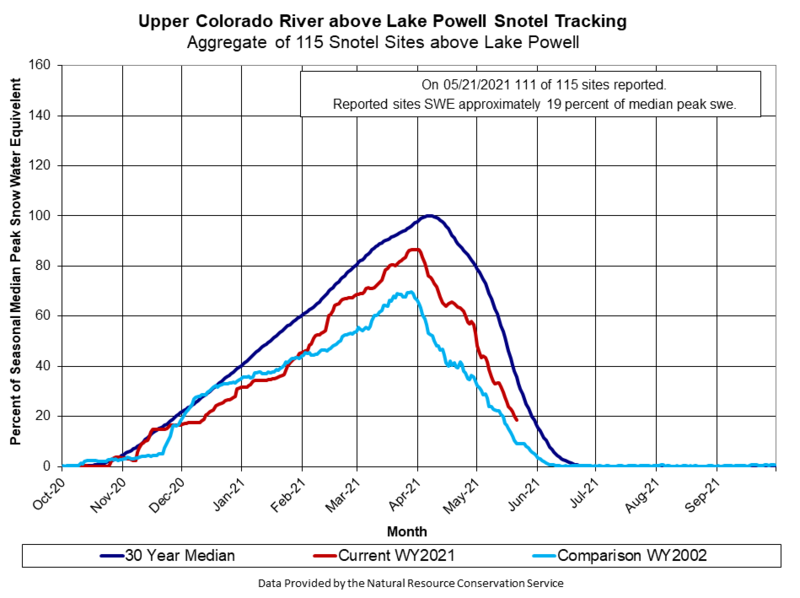 Pursuant to the Aspinall Unit Operations Record of Decision (ROD), the peak flow and duration flow targets in the lower Gunnison River, as measured at the Whitewater gage, will be determined by the forecast of the April – July unregulated inflow volume to Blue Mesa Reservoir and the hydrologic year type. At the time of the spring operation, if the forecast is equal to the current forecast of 925,000 acre-feet of runoff volume, the hydrologic year type will be set as Moderately Wet. Under a Moderately Wet year the peak flow target will be 14,350 cfs and the duration target at this flow will be 10 days. The duration target for the half-bankfull flow of 8,070 cfs will be 20 days. The criteria have been met for the drought rule that allows half-bankfull flows to be reduced from 40 days to 20 days. During spring operations, releases from the Aspinall Unit will be made in an attempt to match the peak flow of the North Fork of the Gunnison River to maximize the potential of meeting the desired peak at the Whitewater gage, while simultaneously meeting the Black Canyon Water Right peak flow amount. 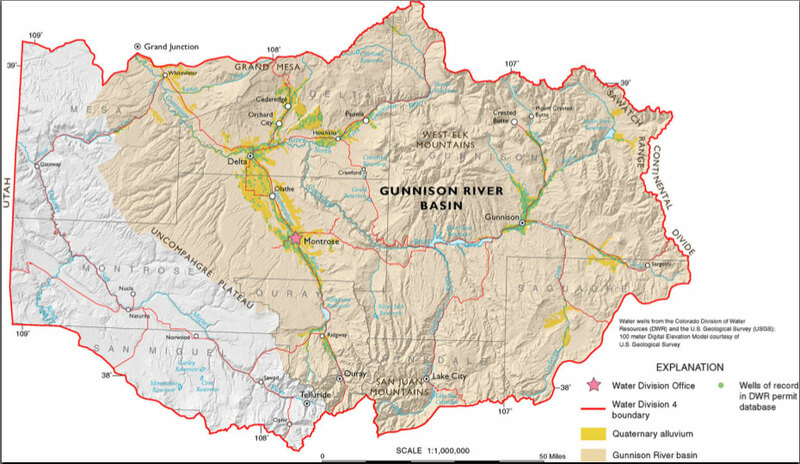 The magnitude of release necessary to meet the desired peak at the Whitewater gage will be dependent on the flow contribution from the North Fork of the Gunnison River and other tributaries downstream from the Aspinall Unit. Current projections for spring peak operations show that flows in the Gunnison River through the Black Canyon could be over 7,500 cfs for 10 days in order to achieve the desired peak flow and duration at Whitewater. With this runoff forecast and corresponding downstream targets, Blue Mesa Reservoir is currently projected to fill to an elevation of around 7500 feet with an approximate peak content of 660,000 acre-feet. The regional director of the Upper Colorado River Basin for the Bureau of Reclamation told water managers and users last week to expect below-average runoff this year, despite encouraging snowfall this winter. Brent Rhees — who oversees the federal reservoirs in the upper basin for the Bureau of Reclamation, including Lake Powell, Flaming Gorge and Blue Mesa — said that although this winter’s snowfall, or “snow water equivalent,” in the upper basin above Lake Powell was now above average (109 percent on Feb. 7) the parched ground left in the wake of a hot, dry 2018 likely would soak up a lot of the resultant moisture in the spring. As such, this year’s runoff is not expected to reach the average level, although storms in February and March could push it up to the 80 percent range. Since Rhees’ remarks, it has been snowing a lot in Colorado, and the snowpack in the Roaring Fork River basin was at 115 percent of average on Feb. 6. But, again, Rhees was looking at future runoff over a thirsty landscape. The inflow into Lake Powell during water year 2018 (Oct. 1 to Sept. 30) totaled about 4.5 million acre-feet, or MAF, while about 9 MAF was released from Glen Canyon Dam to run down the Colorado River and into Lake Mead, Rhees said. As of Jan. 1, the Bureau of Reclamation forecast that 6.98 MAF, or 64 percent of average, would most likely flow into Lake Powell, but releases from Lake Powell are expected to be about 8.6 MAF. “We’re going to release a little bit more than comes in, likely this year,” Rhees said. 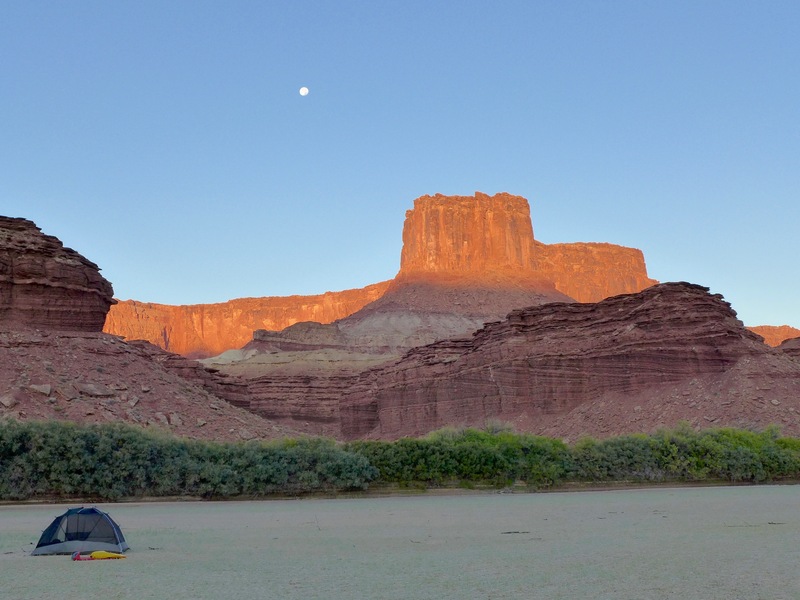 That means Lake Powell is expected to continue to shrink in 2019. On Feb. 3, the elevation of the reservoir, as measured against the upstream face of Glen Canyon Dam, was 3,575 feet above sea level, or 39 percent full, and held 9.6 MAF. 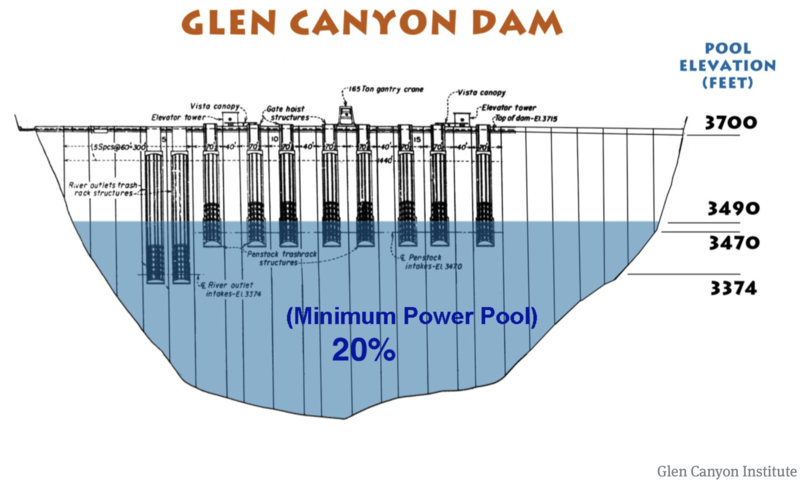 A diagram showing the intake structures on the upstream face of the Glen Canyon Dam, which forms Lake Powell. The first ongoing effort to bolster water levels in Lake Powell is weather modification in the form of cloud seeding. Rhees said the federal government’s position on funding cloud seeding has moved from funding only research to funding active operations, too. “That’s good news from my perspective,” he said. The second effort is “drought-response operations,” which will begin if Lake Powell drops to the triggering elevation of 3,525 feet, or 35 feet above minimum power pool (which it is not yet forecasted to do in either 2019 or 2020). 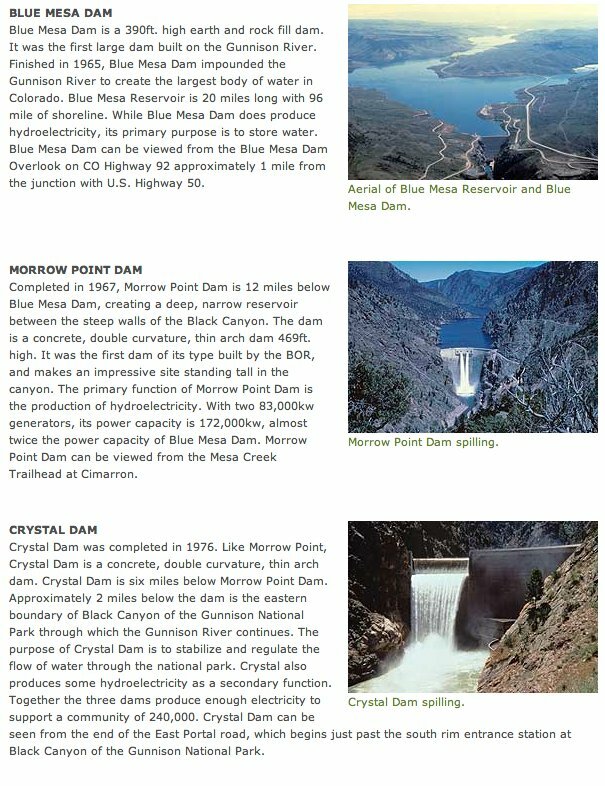 But should the reservoir hit 3,525 feet, the drought-response operations will entail releasing up to 2 MAF of water from federal reservoirs in the upper basin, primarily from Flaming Gorge Reservoir on the Green River, which can hold 3.7 MAF; Blue Mesa Reservoir on the Gunnison River, which can hold 829,500 acre-feet; and Navajo Reservoir on the San Juan River, which can hold 1.69 MAF. He also said the releases from the reservoirs would be “indiscernible” to river users and the water would not come down the river in a big wave of water, as some might imagine. “You won’t know, if you are on the river, that it’s even happening,” he said. The third effort to add more water to the river system is “demand management,” or a purposeful reduction in the amount of water diverted from rivers and put to a consumptive use, such as growing a crop or a lawn. Voluntary demand-management programs are now being investigated in Colorado, Utah and Wyoming, and the water saved by irrigators fallowing fields — for money — is to be stored in a new regulatory pool of up to 500,000 acre-feet in Lake Powell. Editor’s note: Aspen Journalism covers rivers and water in collaboration with The Aspen Times and other Swift Communications newspapers. The Times published this story on Thursday, Feb. 7, 2018. The next Aspinall Operations meeting will be held on January 17th in Montrose at the Holiday Inn Express. The meeting will start at 1:00. Farmers have a taxing job growing crops due to water rights and, now, a multi-year drought, said Montrose County Commissioner Sue Hansen. Those concerns were brought to the forefront during the Western Slope Water Summit — held Tuesday morning at the Montrose County Event Center. The group mostly discussed the water shortage and the drought crisis on the Western Slope. As far as the effects of the drought, residents need look no further than the Gunnison River. “I think we, as an Upper Basin, need to put the hammer down and need to call them out in terms of what they’re doing,” he said. The National Park Service says unsafe levels of a type of algae that can be harmful to humans have been found in the water of a central Colorado reservoir. Park officials said they detected the presence of toxins that can be produced by algae blooms in water samples taken from Blue Mesa Reservoir. The agency advised visitors to avoid contact with shallow waters in an area known as the Iola Basin and to avoid mats of algae throughout the reservoir. The reservoir is part of Curecanti National Recreation Area west of Gunnison, Colorado. Harmful blue-green algae is natural to the area but can spread quickly in warm, shallow water.